Many people spend their Sunday mornings at church and that brings them peace. They feel comfort in the hymnal songs and are brought inspiration in the words delivered in the service. I too enjoy finding, peace, comfort and inspiration on a Sunday morning, but I prefer to do that outdoors with the creatures God granted us the honor of sharing this world with. Sunflowers in the back field. 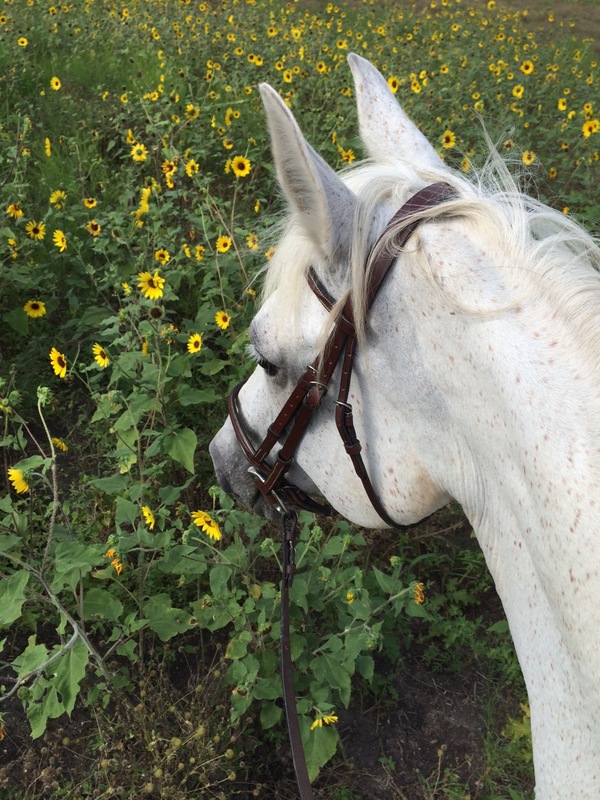 Today I spent my Sunday morning on a trail ride with my big, grey mare. At 7:45 am, there are few other people at the barn, and I could enjoy all the natural sounds of morning and few human-made noises. Although, if I stand at the right place at the barn, I can hear the droning sounds of the cooling system from the Sam Sung Plant that is a few miles away. Mostly the air is filled with the calls of the grackles, white wing doves, house finches and cardinals, with an occasional dog barking in the distance. My mare is a quiet sole so I don’t talk that much to her when we are tacking up, or even on the trail. We can communicate a lot of information by just the most delicate of touches as we plod through the meadows and along the trails. With all the recent rains and wind storms there are a lot trees that have fallen along the path that we have to negotiate, Breeze always chooses the right path to glide over a log or get me safely under a branch- and for that I am grateful. On today’s ride I had a certain goal in mind when we left the barn- I wanted to see the big cottonwood tree at the furthest point we can ride to on the property. The tree rests in an ox bow of one of the creeks as it cuts along through the black land prairie. The tree has stood there long before Sam Sung built their plant, or before the first rancher laid claim to the land, it has peacefully watched over the changing creek for over 100 years. On the way back, we stopped for a quick look at the field of sunflowers. Their happy, bright yellow faces turned to greet the sun as it climbed higher over our heads. The sun was already getting hot so we returned to the barn with a slow walk through the woods where the red shoulder hawks were teaching their young to fly and the wood peckers pounded away- looking for a meal. No song I’ve ever sung in church or words from a sacred book have ever been able to fill me with the inspiration,joy and since of responsibility that I find while quietly walking through the woods, observing all God’s gifts. For each it is different; for me- this is heaven on earth. The name Atomic Cowgirl is something that blends the two worlds that I straddle in my daily life; the fast-paced urban world and the slower-paced realm of nature. Growing up in Austin, TX- I have seen lots of changes since 1973, but I can still find that balance between city life and country life that I grew up with. Granted, that balance isn’t always easy to find and some days are a struggle to continue to have that connection with nature when the demands and distractions of the urban world are pounding at the door. I hope you will enjoy the chronicle of my journey to stay firmly planted in both worlds and perhaps you too can start to consider how you will find that balance in your life.